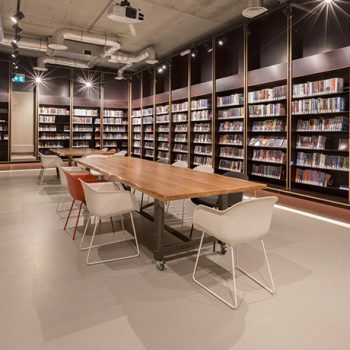 The Openbare Bibliotheken Amsterdam, OBA, in the Netherlands is setting out on a new course to revitalise her branches. 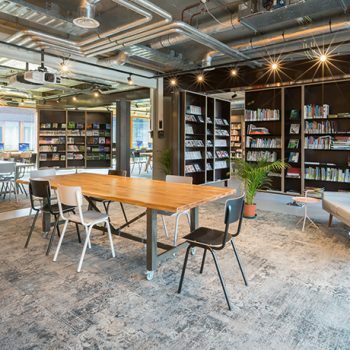 Both new and existing libraries are being transformed into attractive ‘third places’, tailored to the needs of its direct surroundings. This is done with at least one partner from other disciplines, such as hospitality, societal or cultural organisations. Third spaces play a strong social and connecting role next to the first space, the home, and the second space, work. 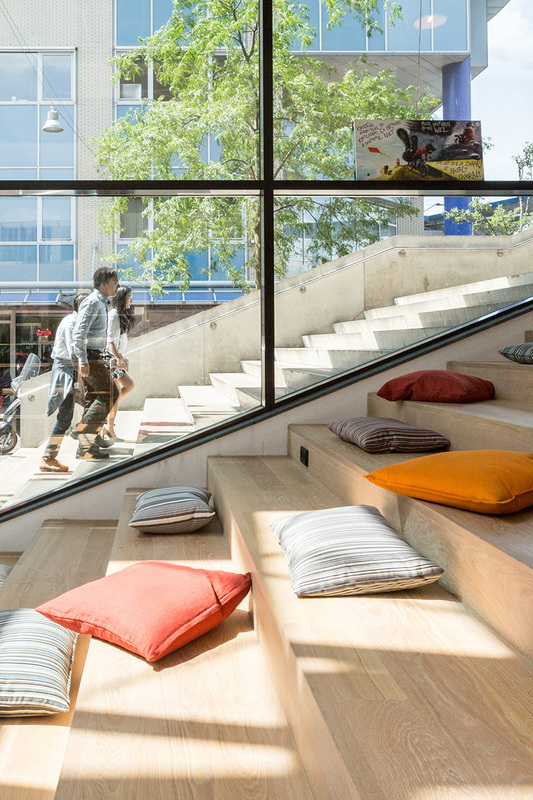 Examples of third spaces are public places like parks, but also theaters and libraries. The new direction of OBA is aimed at creating added value for the community: places to learn, stay, meet and above all get inspired. 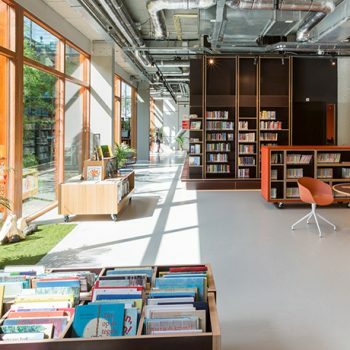 Apart from creating thoughtful interior designs, this is shown in their dedication in organising community events that are not just limited to literary happenings, but also include workshops, exhibitions and maker spaces, for audiences of every age. 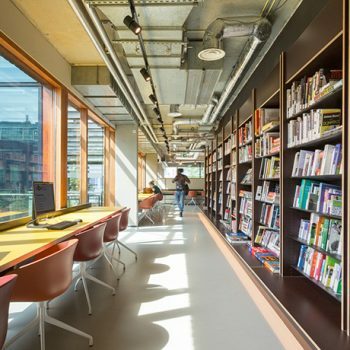 Dutch architect Aat Vos specialises in developing relevant third spaces for the general public. ‘When people meet each other at places like OBA Bijlmerplein, new social bonds are formed. 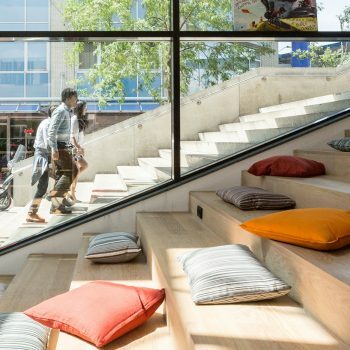 It creates space for innovation’, according to the architect. 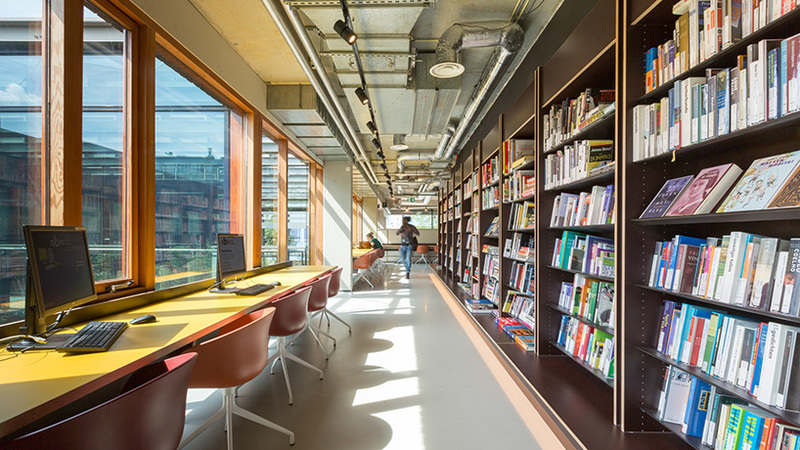 ‘Self-service’ OBA Bijlmerplein is a place to linger for hours, to discover the many bookcases throughout the building. The first floor reveals an unexpected extra wealth of information as well as a self-supporting meeting room with rotating wall and kitchenette. 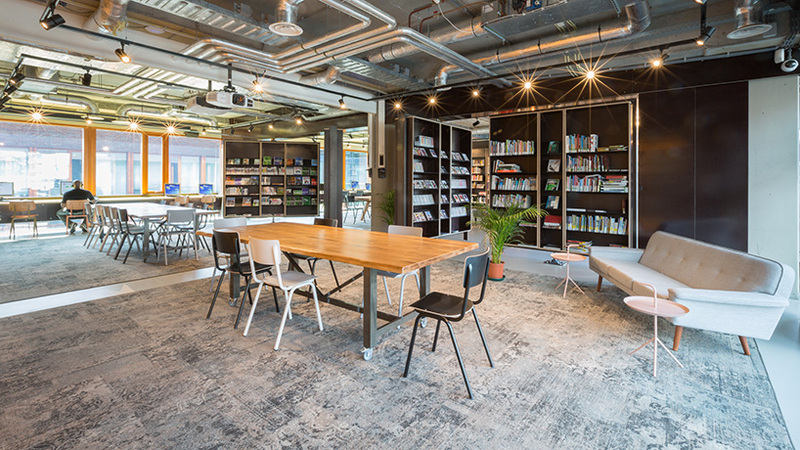 Throughout the building you find places to read, to work, to study or to hold meetings. From long wooden tables with vividly colored chairs to comfortable sofas. There’s also a children’s corner where kids can play and color. 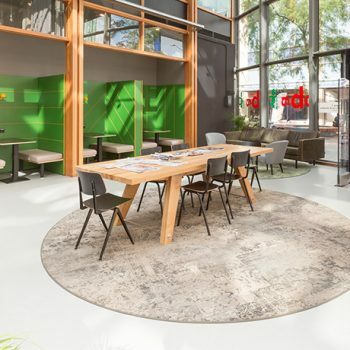 At the right side of the entrance, there are private seating corners with bright green walls: These serve as meeting points for informal gatherings. 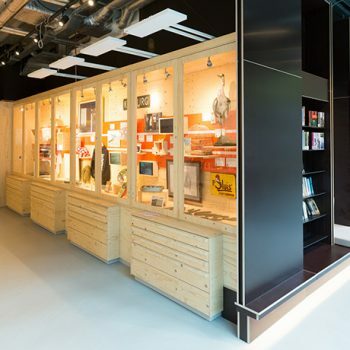 Other striking elements are the private lockers and the wall with revolving bookcases. OBA Bijlmerplein is open six days a week, two mornings of which are ‘self-service’ with no support from OBA employees. 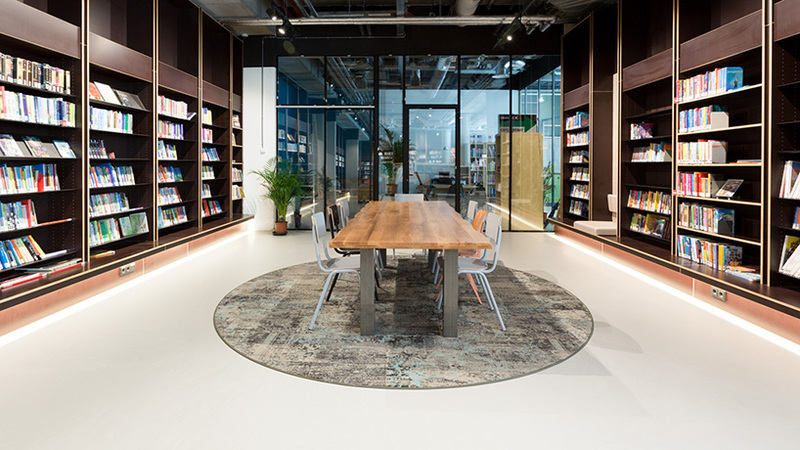 The small size of the round counter that serves as both the information desk and customer support desk underscores the low-threshold character of the library. 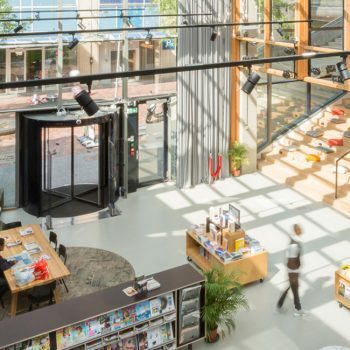 OBA x Imagine IC OBA Bijlmerplein places heavy emphasis on the presentation of the collection and connecting the neighborhood, its citizens and its history. At this new location, OBA and Imagine IC work and live together. Imagine IC collects, visualises and saves new stories about our contemporary society. They search the streets for stories that tell us something about the daily life of today’s youth. 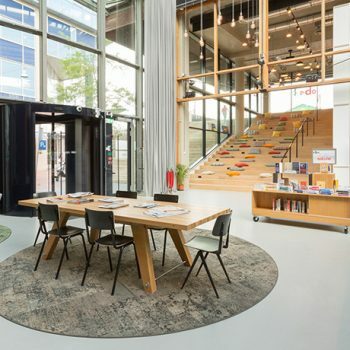 Since OBA is all about stories, the connection they have is easy to see and the reason they decided to share the space at OBA Bijlmerplein. Together with Imagine IC and several organisations from the surrounding areas, OBA organizes activities and expositions. 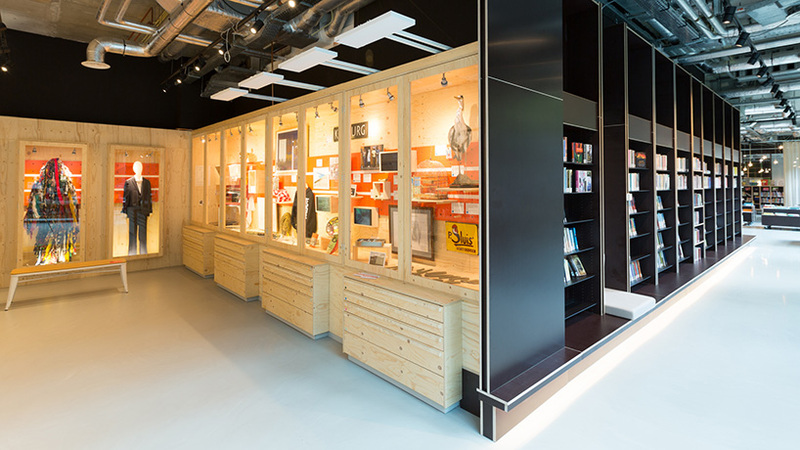 The expositions are showcased in the exhibition space on the ground floor and on the walls next to the stairs. Welcoming light, height and space. Meet and greet or study area at OBA Bijlmerplein. You can lounge on the over-sized pillows on the steps and the stairs turn into a grandstand during presentations. When you enter the library, you immediately notice the wide and 4,5 meters high stairs on your left. The stairs strongly reference the outside stairs that connect the two levels of the Bijlmerplein. Private seating corners with bright green walls. 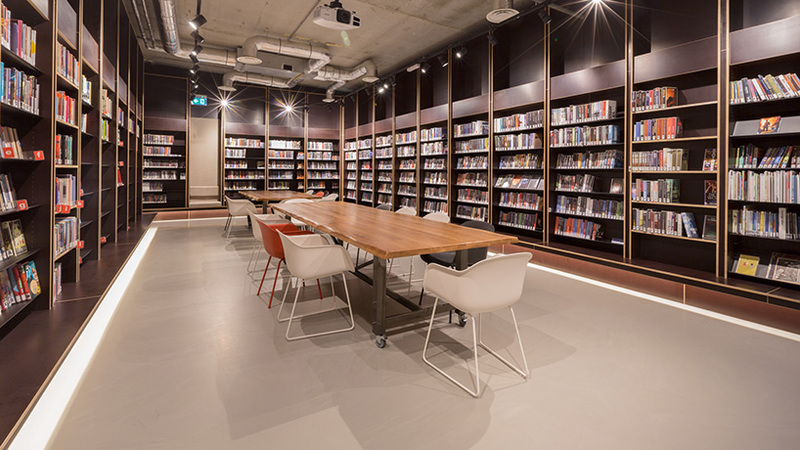 At the first floor of OBA Bijlmerplein. 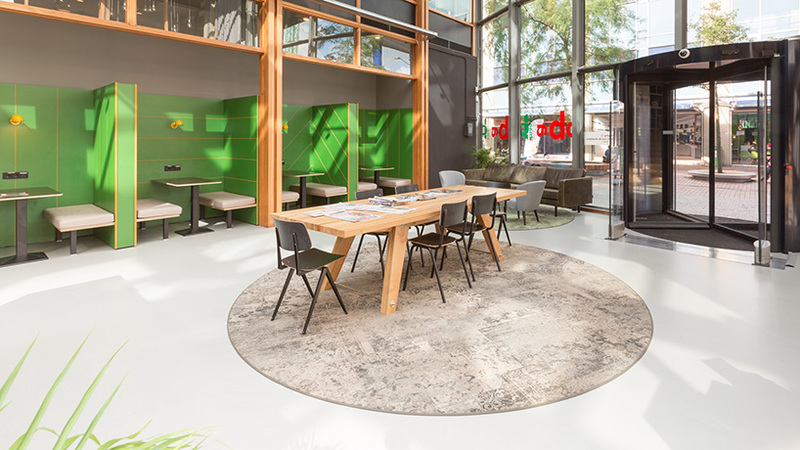 There is a special corner for the youngest visitors at OBA Bijlmerplein. 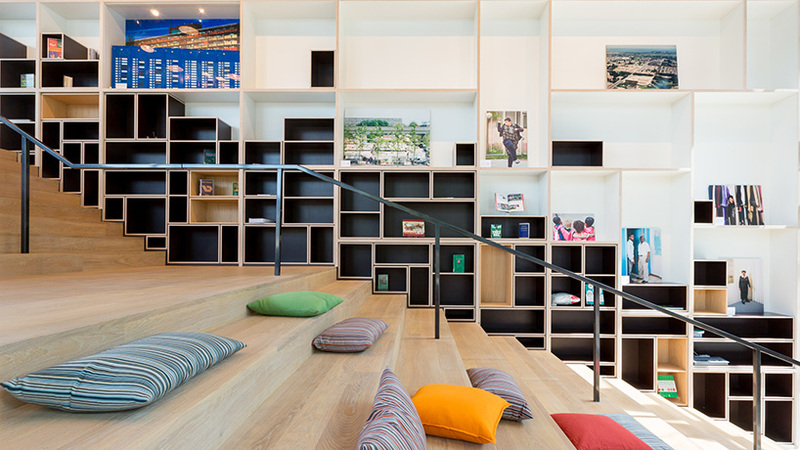 Striking element: the wall with revolving book cases. 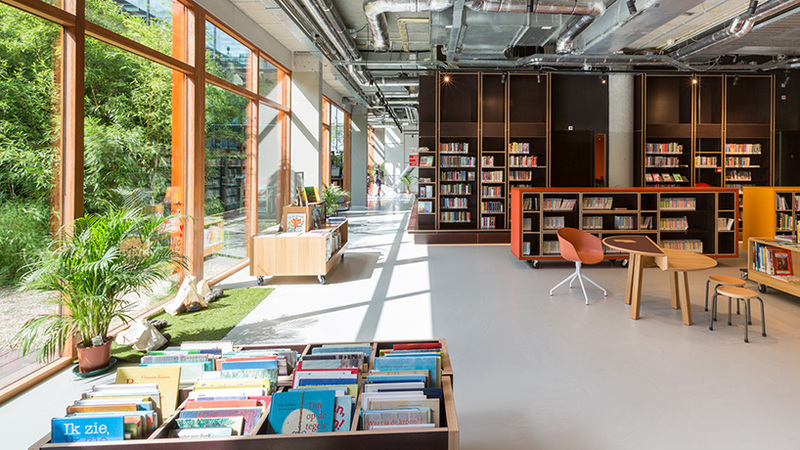 OBA Bijlmerplein is a place to linger for hours, to discover the many bookcases throughout the building. The seventies are visible as a theme throughout the interior design. Together with Imagine IC and other organisations from the surrounding areas, OBA organises activities and expos.